Welcome to the SJAC Feltonfleet website. 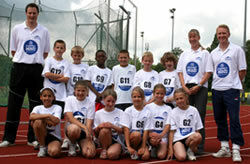 It is our aim to provide a fun and fulfilling environment for every athlete that takes part in SJAC athletics sessions. We run, jump and throw; have fun, learn and measure performance. For more information, please see the About the SJAC page. Last Session of Spring Term: Last Thursday 21st March 2019 (No session this week). First Session of Summer Term: Thursday 2nd May 2019. Thanks for all your support this term. Just a reminder - there are no sessions this week. Just a quick email to let you know that the SJAC - Feltonfleet website is now operational. Please take a look at the following links to follow the progress of your children. Please also look out for personal email updates where your children have achieved Personal Best performances and/or attained Gold, Silver or Bronze standards. Hope your children are enjoying our sessions. December Athlete of the Month - Maria has achieved lots of Personal Bests this month, has put in lots of effort and challenges herself with a great enthusiastic attitude. Copyright © 2019 SJAC. Website by Simbax.